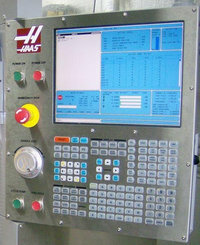 Haas Settings are Haas machine conditions that have an affect on machine operation. Haas Setting 203 Live Image X Offset – Haas Lathe Haas Setting Description Locates the top of the scaling window relative to the machine X zero position. The default is zero. Haas Setting 217 Show Chuck Jaws – Haas Lathe Haas Setting Description Controls the display of the chuck jaws in live image. Haas Setting 215 Show Feed Path Live Image – Haas Lathe Haas Setting Description Controls the visibility of a solid blue line that represents a feed path in live image. Haas Setting 227 SS Stock Length – Haas Lathe Haas Setting Description Controls the length of the secondary spindle from the left of the part. Haas Setting 214 Show Rapid Path Live Image – Haas Lathe Haas Setting Description Controls the visibility of a red dashed line that represents a rapid path in live image. Haas Setting 226 SS Stock Diameter – Haas Lathe Haas Setting Description Controls the diameter of the part where the secondary spindle clamps it. Haas Setting 225 Flip Part Stock Length – Haas Lathe Haas Setting Description Controls the new length location of the jaws after flipping the part. Haas Setting 230 SS Jaw Height – Haas Lathe Haas Setting Description Controls the secondary spindle jaw height. Haas Setting 229 SS Clamp Stock – Haas Lathe Haas Setting Description Controls the secondary spindle clamp stock value. Haas Setting 228 SS Jaw Thickness – Haas Lathe Haas Setting Description Controls the secondary spindle jaw thickness. Haas Setting 235 SS Machine Point – Haas Lathe Haas Setting Description Controls the machining point (the location where the secondary spindle machines a part) for display purposes in Live Image…. Haas Setting 231 SS Jaw Step Height – Haas Lathe Haas Setting Description Controls the secondary spindle jaw step height.